Welcome to Amber class I am Colette the Class teacher, Mandy and Michelle are the TA2's and Julie, Adele and Alesia are the Teaching Assistants. The pupils in Amber class are Abigail, Ajwad, Asam, Callum, Kieran, Lionel and Safwaan, they all love to listen to Music especially One Direction. This half term Amber class will be studying the book Room on the Broom written by Julia Donaldson and Axel Scheffler. The children will be participating in writing, creative, ICT and cooking activities related to this Literacy book. Description from Amazon - The witch and her cat fly happily over forests, rivers and mountains on their broomstick until a stormy wind blows away the witch’s hat, bow and wand. They are retrieved by a dog, a bird and a frog, and each animal asks for a ride on the broom. They climb on, one after the next, until the broom is so heavy that it snaps in two! What will happen next as they tumble into a bog and meet a greedy dragon? Our topic this half term is New life and we will be looking at plants and how they grow. This week we have looked at seeds and planted sunflower seeds. The children took great care to plant them and place them in a sunny place in the classroom. The children will water the seeds and observe how much they grow this half term and take them home when we break up. We will be studying the plants found in the school and surrounding areas and learn what things make them grow. Amber class will have the opportunity to observe live caterpillars to learn about the lifecycle of a butterfly. They will take picture to record the changes the caterpillar makes until it emerges as a butterfly. Linked to this topic we will be reading The hungry Caterpillar. Amber class will be looking at minibeasts, sorting them into groups, finding out where they live and what they like to eat. This half term our Topic is 'Treasure Island. We will be theming our work around Pirates and the sea! We shall be catching up with Barry and his friends again but this time with a new character the hairy scary monster. 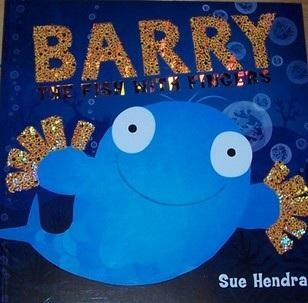 In this sequel Barry and his friends love to play hide and seek and discover their new friend in a ship wreck. Look back soon to see what we get up to! We used a green screen to transport ourselves under the sea. The props we used were painted in class last week and looked really effective. Once the final edit has been done of our video, we will be sharing that on our website as well so watch this space. We made a fantastic display board that included a piece of work from each child, from a description of Puffy and Barry to creating bubbles from Puffy on the 2 simple ICT package. In cookery we made homemade fish fingers that the children enjoyed preparing, cooking and eating. During our Cafe Topic work the children in Amber class spent the first two weeks experiencing traditional afternoon tea. The children made a cup of tea, tasted different flavoured tea and created their own tea bags in Science! They have made cucumber sandwiches in Cookery and have baked scones and a Victorian sponge to eat in the Cafe. The children invited a special guest to afternoon tea and had a lovely time serving their guest tea and cakes and enjoyed sampling them too in the café created in school. The traditional English café was transformed into an Indian restaurant and the children sampled poppadoms, mango chutney, vegetable curry, naan bread etc. This week the café has been transformed into an Italian restaurant and the children have created and tasted their own pizza. In Numeracy the children have been learning about money using role play in a toy shop and a café using money to buy toys and cakes, biscuits from the café.